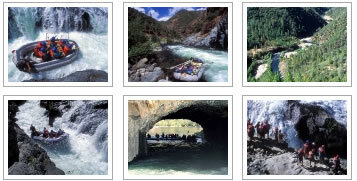 The Middle Fork of the American River is one of the most popular commercial whitewater runs in the Mother Lode. It’s the perfect “next step” for rafters and kayakers looking for a challenge because of its many class III and class IV rapids. A mellow stretch in the middle of the day lets you unwind and enjoy the beauty of the canyon too. The Middle Fork is 50 miles northeast of Sacramento up the Hwy 80 corridor, and 17 miles from the Gold Rush era town of Auburn. People coming from the San Francisco Bay Area also find it an easy day trip. Who should go: Intermediate rafters. Adventurous first time rafters are welcome on commercial trips. There is no lack of rapids or breathtaking beauty on the Middle Fork. Class III and IV rapids are both technical, fun, and the whitewater ends with a great grand finale lineup. Read more about Middle Fork American Whitewater. Upstream dams guarantee water throughout the summer from 8 – noon. The ideal Middle Fork flows are between 1200 cfs and 1500 cfs. 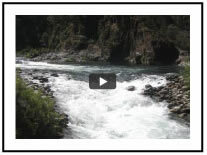 Learn more about Middle Fork River Flows. Because of irritating logistics, a fairly long shuttle down a dirt road, and some not-so-fun-in-a-kayak rapids (Tunnel Chute), the Middle Fork is rarely seen by private boaters. Keep reading about Middle Fork American Logistics. Watch a Middle Fork American video before you see it up close.